In this film, you will discover a revolutionary new water activity called Kitefoil the hydrofoil for kiteboarding is inspired from board foil used by Laird Hamilton in the wave, and sailing boats on the foil America's Cup. The sensation of flying over the water is completely amazing, it's like a magic carpet or a bird flying over the water. the feeling is amazing as surfing in powder snow . This kitefoil full carbon is completely removable, comes with its own bag for travel and assembly tool. The wings of this kitefoil were designed to have the best compromise, stability, performance and accessability . The Alpinefoil can be used from 4/ 5 knots and up to read 35 knots . in their own webmapping applications through our GeoGarage API. The marine and coastal zones of the world host a growing number of overlapping and at times competing uses and activities. The commercial, recreational, cultural, energy, scientific, conservation, security, and other interests of these users drive our ocean priorities. These include the protection of life and property, securing renewable energy resources, developing and sustaining ocean productivity, supporting national security and of course ensuring its enjoyment by recreational boaters. 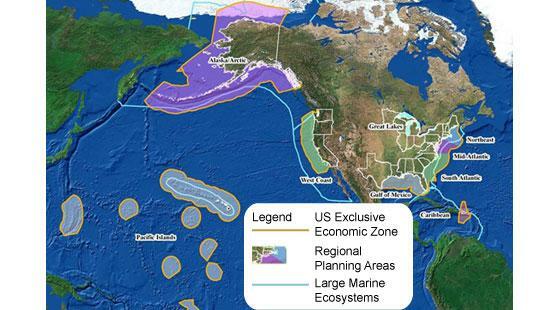 The increasing degree to which legislators are controlling both national and international waters is due to the growth of awareness in the importance of management of the ocean’s resources (image courtesy of NOAA). Smart ocean planning helps guide these priorities and creates a program that organizes the demands placed on the ocean by industry and individuals. Smart ocean planning is an adaptive, integrated, ecosystem-based planning process that uses sound science and good data. It is developed for analyzing current and anticipated use of offshore, near shore and coastal space. In practical terms, ocean planning provides a public process to better determine how the ocean and coasts are sustainably exploited and protected now and for future generations. Smart ocean planning provides the evidence to support plans for development in the most suitable sites for a range or class of activities. It provides the information that will reduce conflicts among different users, reduce environmental impacts, facilitate compatible uses, and preserve critical ecosystems. Some examples of successful ocean planning include moving shipping lanes outside of Boston Harbor to prevent hitting whales and protecting the coral reefs of the Florida Keys. Given the size and extent of the ocean, the limited worldwide oceanographic fleet cannot adequately document navigation and environmental hazards, especially in support of smart ocean planning dynamics. Over the past several years, the scientific community has begun supplementing the work of these ships with fixed sensors. In the United States, the National Science Foundation Ocean Observing Initiative and the National Oceanic and Atmospheric Administration (NOAA) Integrated Ocean Observing System are establishing permanent surface and seafloor installations that allow for constant and persistent monitoring of ocean processes. The drawback is that these fixed-location sensors are relatively expensive to operate, limiting how widely they can be dispersed. Every citizen in the United States can help with smart ocean planning by encouraging legislation that supports it. However, recreational boaters and those that work in the marine industry have the opportunity to also contribute much needed data, often using the sensors already installed on their boats. ARGUS™ is a patented, autonomous, crowdsource bathymetry (the study of underwater depth) system that provides continuous, automated acquisition and processing of depth data. 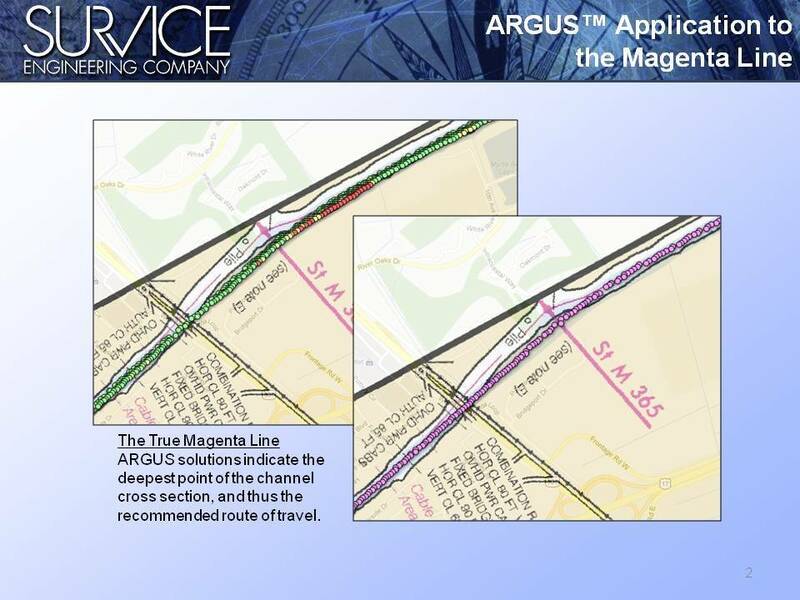 ARGUS™ interfaces with vessels’ existing GPS and depth-finding systems and automatically processes the information for both data aggregation and sharing across the web. Originally demonstrated as part of a NOAA research grant, ARGUS™ has processed over 100 million depth soundings from an international fleet ranging from 18-foot bass boats to 1000-foot commercial cruise liners. The wide spectrum of users provide representation for the maritime community in the ocean planning process, and provides valuable data in support of this process for areas that may not have been surveyed in decades. The National Ocean Policy highlights the importance of stakeholder participation throughout ocean planning. 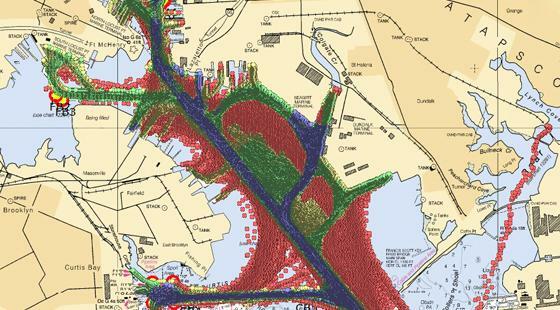 ARGUS data helps track the uses of different types of boats in Baltimore Harbor and provides indications as to the current state of shipping channels. ARGUS™ is being used to great effect in one of the busiest waterways in the United States, the Intracoastal Waterway (ICW). The Salty Southeast Cruisers’ Net is an online social media forum focused on the ICW, and is a treasure trove of useful reports and articles provided by and consumed by ICW cruisers. 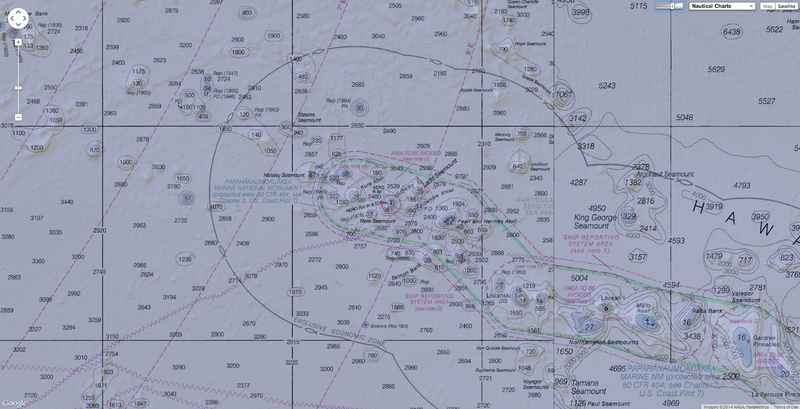 The website informs others via chart displays, enhanced with access to information such as fuel prices, marina accommodations, and navigation hazards like misplaced buoys and shoaling. These reports are also enhanced by the millions of water depth measurements made by cruisers during their routine ICW transits, autonomously delivered and processed through the ARGUS™ crowdsource bathymetry innovations of SURVICE Engineering and CARIS USA. What was previously a fleeting number on a chartplotter screen, that may or may not have been looked at and interpreted, is now useful knowledge thanks to this pioneering partnership. How do you know that data is trustworthy? We can all appreciate the value of repeated measurements. If my boating neighbours and I consistently measure the same depth in a location, we become confident in that depth measurement. The concept of “trusted partner” development strives to advance the crowdsource bathymetry process by certifying the incoming data and maximizing the accuracy and utility of the aggregated solutions. This is being done through the application of ever-improving hardware and scientific expertise in the field of hydrography, fueled by academic interests in big data and information visualization. Continued development will soon make information gathered from crowdsource bathymetry better than the pre-1940s “soundings” that are the basis for the majority of modern charts. The concept of trusted partners is the perfect complement to the limited availability of both ships and fixed ocean sensors, enlisting ships of opportunity from the maritime industry along with recreational boats, to collect a wide range of oceanographic and meteorological data. This is a powerful and practical approach that inexpensively leverages an unlimited, distributed workforce that frequents, as well as relies on, the marine and coastal zones of interest as shown in Figure 3. 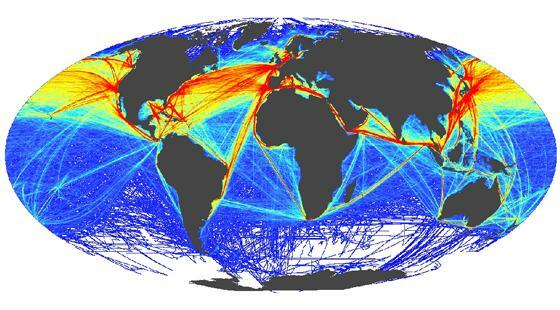 Vessel traffic is highest in the same coastal zones in which smart ocean planning is most needed. Leveraging these vessels, of which there are millions available, insures that mariners are involved in an ocean planning process that is based on scientific measurements rather than uninformed policies. Very localized weather and other environmental data from this worldwide ocean-going fleet can also be input to weather models or used for confirming the data supplied by satellite systems. Better forecasting combined with real-time dissemination to the vessel bridge will provide safest routing as vessels negotiate ocean storms. Additionally, real-time updates from the ship ahead can provide following vessels with advance warning of conditions. Trusted partnerships are self-enabling opportunities for industry to not only collectively reap the benefit of each other’s measurements, but also to collectively influence longer-term smart ocean planning with trusted data. Industry’s contributions are matched by scientists, researchers, and the public at large, to complete the partnership. Making involvement in trusted partnerships a part of a company’s corporate social responsibility policy demonstrates a theme of contributing to society. Such responsible companies are generally welcome neighbors and are looked upon favourably by local consumers and environmental advocates. The most effective ocean planning will come from a mature and growing marine spatial data infrastructure of traditional data sources complemented by trusted partners contributing to the greater purpose. Such partnerships will speed progress toward better environmental management, and provide for unprecedented sharing of information and costs across the base of ocean users. GEBCO : Where are the bathymetric hot-spots ? NOAA scientists are testing two types of unmanned aircraft this summer to survey a variety of rare and endangered species, monitor remote marine areas, locate marine debris for removal and study fragile ecological features in the vast Papahānaumokuākea Marine National Monument in the Northwestern Hawaiian Islands. “This summer’s research is an ideal way to look at the potential of unmanned aircraft to revolutionize marine science and management,” said Robbie Hood, director of NOAA Research’s Unmanned Aircraft Systems Program. NOAA scientists launched small unmanned aircraft called Pumas from the deck of NOAA Ship Hi‘ialakai in June to video and photograph green sea turtles, Hawaiian monk seals and seabirds. The Puma, with its nine-foot wing-span, flew below 500 feet to take high quality video, infrared and still photographs. The Puma also took images of marine debris at sea and surveyed coastal shoreline and bird nesting habitat. “This is a great example of how investing in our ability to deploy state of the art technology to conduct observations in remote locations can provide critical data to help NOAA in our conservation and resilience missions,” said Todd Jacobs, a scientist working with NOAA’s Unmanned Aircraft Systems Program who is leading the Hawaii mission. Coordinator for NOAA's Unmanned Aircraft Systems (UAS) Program Todd Jacobs discusses the PUMA model, equipped with video and photo functionalities, is being utilized near La Push, Wash., to survey wildlife and locate for tsunami debris. “The monk seal mission was wildly successful,” said Charles Littnan, NOAA Pacific Islands Fisheries Science Center lead scientist for Hawaiian monk seal research. The second part of the mission, beginning in mid-July, involves flights by NASA’s Ikhana from the Pacific Missile Range Facility in Kaua‘i. NOAA is using the Ikhana to better understand vessel activity in sensitive areas of the monument, as well as assess its ability to survey marine species and locate marine debris over a larger area of the 139,797 square mile monument than Pumas could reach. The Ikhana is a medium altitude, long-endurance aircraft with 66-foot wingspan that will be flown at about 24,000 feet while surveying for vessels. It will drop down to lower altitudes when taking images of wildlife. It’s equipped with radar that can scan over 100 miles, infrared and video cameras. “These missions allow us to test the unmanned aircraft’s effectiveness in locating marine debris, such as ghost nets, and identifying high density debris areas,” said Kyle Koyanagi, Pacific Islands Regional Coordinator for NOAA’s Marine Debris Program. This image was taken by the Puma of Trig Island. Terrestrial habitat: Improve the monitoring of rapidly changing coastal habitat. Maritime vessel activity: Assess the value of UAS to better understand vessel activity and any potential risks to the monument’s natural, historic and cultural resources. Scientists from NOAA Research, NOAA Fisheries, NOAA’s Office of Marine and Aviation Operations, NOAA’s Marine Debris Program, Papahānaumokuākea, and NASA are working together on this summer’s mission. Paul Woods (Skytruth) Snippet: "Automated Fishing Behavior Heatmap using SpaceQuest AIS data." Let’s put it this way: If a fishing boat illegally scoops up a load of fish in the middle of the ocean and no one is there to see it, it’s still illegal — but until now there has not been much anyone could do about it. It turns out that satellites a few hundred miles above earth are a lot better at surveying the high seas than, say, a lone Coast Guard boat with a spyglass, especially in the most remote waters where fishermen may be used to acting with impunity — ignoring quotas, transferring fish from ship to ship, dumping bycatch, even changing the vessel’s name between ports like a Shakespearian youth slipping casually into drag. Thanks to new projects in high-powered satellite surveillance, it may be possible to put an end to pirate fishing once and for all. A Taiwanese-flagged fishing vessel suspected of illegal fishing that was stopped and boarded by the US Navy in 2009. This is good news for, let me see, about a billion people. Illegal fishing takes as much as 26 million metric tons of fish from the sea every year, or about 1 in 5 fish sold, for a grand theft of $23.5 billion total (or, to put it yet another way, almost 16 times the GDP of Belize or a mere seventh of the market value of Facebook). That’s money that doesn’t go to the fishermen who play by the rules, while lawbreakers put pressure on already overfished stocks like tuna and swordfish. And while illegal fishing has been getting a lot of press – notably, President Obama issued a memo on the subject last month — it’s hard to make a real dent in it without some serious international cooperation. Ships need to be traceable as they travel from one country’s maritime oversight into another’s, and enforcement needs to be stern enough that the risks of fishing illegally outweigh the rewards. To this end, the Pew Charitable Trusts’ Ending Illegal Fishing Project teamed up with Oxford-based group Satellite Application Catapult to turn an all-seeing eye to the problem of piracy. By combining satellite-gathered signals from ship transponders with other data, whether crowdsourced or supplied by fishing enforcement agencies, Catapult can piece together a cheat sheet that identifies any vessel by name history, ID number, and the details of its fishing license. Once the relevant authorities have access to that information, they will be able to spot illegal or unreported fishing in even the most remote areas, then zoom in to make the arrest. 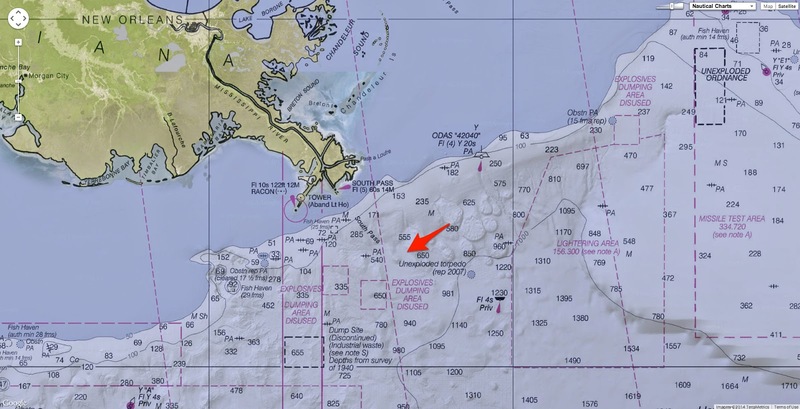 That big Ukranian ship hanging out in the marine protected area? This pilot project from Catapult is the latest in a string of tools Pew has thrown at the problem of illegal and unreported fishing. 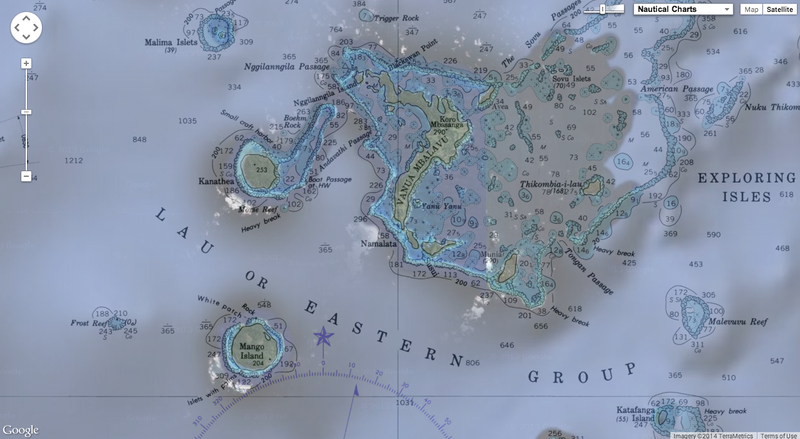 Last year, the group partnered with a small but spunky nonprofit located in West Virginia, SkyTruth, to use open-source satellite data to detect and document illegal fishing around Easter Island, a smidge of an island in a tuna-rich corner of the South Pacific, about 2,000 miles off the Chilean coast. SkyTruth, under the guidance of geologist John Amos, had previously made its name collecting satellite images of mountaintop removal in Appalachia, fracking wells in Pennsylvania, and a certain infamous oil spill in the Gulf. But while publicly available satellite imagery are a great resource if you know where to look (as in, look roughly where the mountain used to be), it is too expensive and time-consuming to scrutinize every visible mile of the ocean’s surface (turns out, the world is BIG). So Amos and co. turned instead to other publicly available satellite data to tell them when and where to look for illegal fishing. 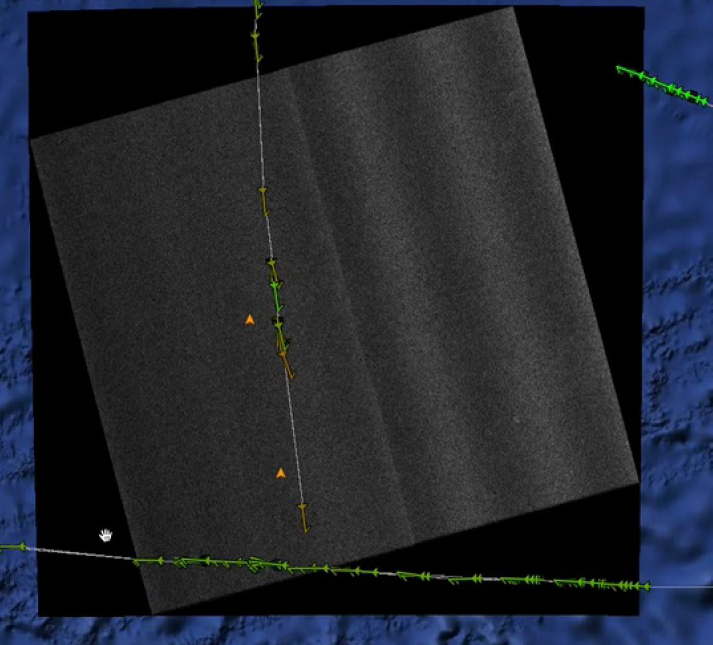 SAR image with vessel detections (orange overlaid with AIS tracks (green). Most vessels have a transponder system, called an Automatic Identification System, that sends and receives little declarative pings to help ships avoid collisions. It just so happens that these pings can be intercepted by orbiting satellites, leaving a trail as a single ship pings its way across the sea. The only problem is that fishing boats can easily send fake identifying information through their transponders, or shut them off altogether. Sometimes fishermen do this just to keep other fishermen from getting wind of a good spot, but often it’s for more nefarious reasons. Without reliable IDs, the SkyTruth team instead tried to narrow in on the likely suspects by using low-res radar imagery to detect the presence of a ship, and sometimes even its speed and direction, then cross-referencing that with the transponder signal (or lack thereof). The boats that did not identify themselves and could not otherwise be accounted for, SkyTruth surmised, were probably up to no good. 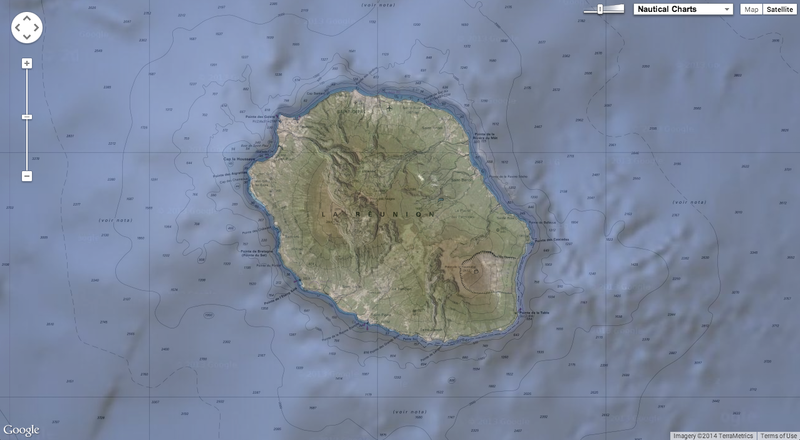 After a year of watching Easter Island, SkyTruth had enough data to estimate the total amount of fishing that was going on, and had singled out more than 40 unidentified vessels that had been unknown to Chilean maritime authorities. As for Pew’s collaboration with Catapult, the aim is to take this kind of monitoring global, pumped up with some extra data not available to civilian groups like SkyTruth and made affordable for every country. There are some policy measures needed to cinch the deal – confirmation that vessels are all ID’ed with a unique code from shipyard to scrapyard, measures to ensure accountability in ports, etc – but the final, crucial step is to supplement the proverbial stick of increased enforcement with the carrot of higher profits (yum). Tony Long, director of Pew’s Ending Illegal Fishing Project, put it this way: “The vast majority of fishermen want to fish legally.” So why not give them a way to prove they’re doing it? If retail chains demand traceability from their suppliers, and can promise them a premium price at the counter, then it’s in fishermen’s best interest to opt into a monitoring system. Instead of putting the onus on enforcement agencies, this is a way to shift the burden of proof to the fishermen who want to do business legitimately. Then, if the good guys keep their transponders on, it will be even easier to spot shady behavior from afar. Here I will utter environmentalists’ tepid catchphrase: All this is not going to happen overnight — but it is happening all the same. The Catapult project is in advanced test stages before its official launch. Amos believes there will be enough satellite coverage to generate a complete, uninterrupted picture of all the fishing in the world’s oceans in as little as three years. SkyTruth is currently working with nonprofit Oceana and Google to visualize all the vessel tracking data available — that should launch at the end of the summer, and give internet dabblers a more immediate sense of the ways humans move around the ocean. “Just getting people to see this stuff is an incredibly powerful gateway drug,” Amos said. Which, if you like narcotic metaphors, is a pretty good one for the kind of citizen science that satellites have made possible. 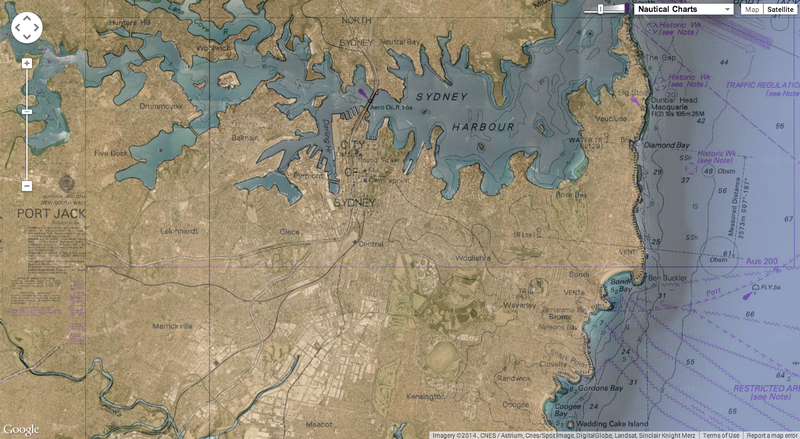 GeoGarage blog : Google can track ships at sea / Can technology end pirate fishing? A huge portion of the U.S.A. is underwater - what mysteries await us in these unexplored regions right in our own backyard? If you’ve ever wanted to see a shipwreck up close in real time, now’s your chance. Over the next week the Hercules Remotely Operated Vehicle (ROV) will be exploring a section of the Gulf of Mexico home to a sunken German U-Boat and a U.S. passenger ship from World War Two. And you can watch the vehicle’s exploration of the area live as it also observes brine pools, lakes and deep-water coral reefs, beginning late afternoon UK time (early afternoon in the U.S.) today. This mission is just the latest adventure this year for the Nautilus ship and its crew, operated by Noaa’s Ocean Exploration Trust. E/V Nautilus dove on an sonar unknown target, thought to be a 500 foot-long shipwreck. After a survey of the vessel the Corps of Exploration successfully identified the wreck as USS Peterson (DD-969). It has already performed several successful missions and has more scheduled up to the end of the year as part of the 2014 Nautilus Expedition. This particular project is known as ‘Exploring the Unknown America’, during which it may visit up to four shipwrecks. Of the shipwrecks that might be visited, one is the German U-boat U-166, which sank with all hands on deck in 1942 from depth charges released by American patrol vessel PC-566. This makes it the only known U-boat to be sunk in the Gulf of Mexico. Nautilus visits U-166, one of two U-Boat wrecks in the Gulf of Mexico. The boat was sunk early on in World War II, sinking only four ships before being destroyed by a U.S. Naval vessel next to its final target, the Robert E. Lee, in 1942. The sinking of U-166 followed its own attack on the steam passenger ship Robert E. Lee, which it torpedoed and sent to the bottom of the ocean a few minutes prior. Of the 270 passengers on the ship, however, 250 of them were saved by PC-566. The Robert E. Lee was the final ship sunk by U-166, a German U-Boat that attacked vessels in the Gulf of Mexico during World War II. 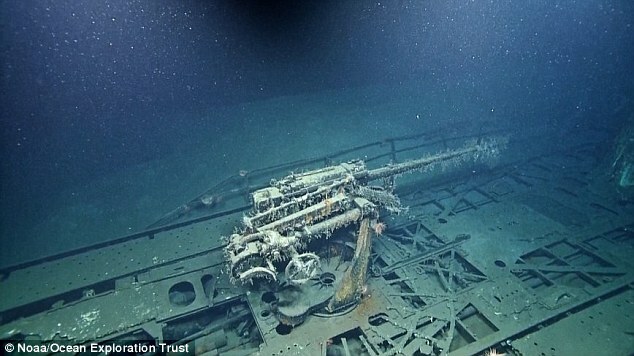 They sit less than two miles apart on the seafloor after U-166 was destroyed by a U.S. naval ship. The attack on the passenger ship was a result of Germany’s policy of ‘unrestricted submarine warfare’ in World War Two, which saw them target ships of any sort. The wrecks of the two vessels are just a few miles apart in the Gulf of Mexico. The Hercules remotely operated vehicle is preparing to explore the Gulf of Mexico over the next week including several shipwrecks, one being the German U-boat U-166 (gun shown). 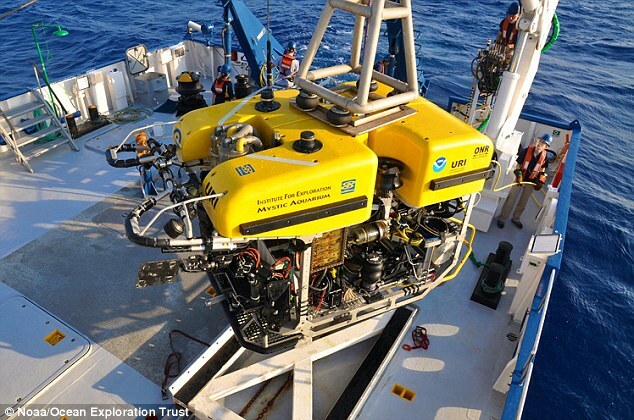 Hercules is a neutrally buoyant yellow remotely operated vehicle (ROV) and is the workhorse of the Nautilus Exploration Program. Hercules is equipped with six thrusters that allow the pilots to ‘fly’ it in any direction, plus two manipulator arms designed for collecting samples and recovering artifacts. Video from Hercules' high-definition main camera is streamed up a fiber-optic cable to the control van on Nautilus, then out to the world. It is capable of operating down to 13,100 feet (4,000 metres). Other potential sites for exploration by the Hercules include two oil tankers that were also sunk by German U-boats in World War Two, the Gulf Penn and Gulf Oil. These tankers are particularly interesting because they have a high number of large corals growing on them. 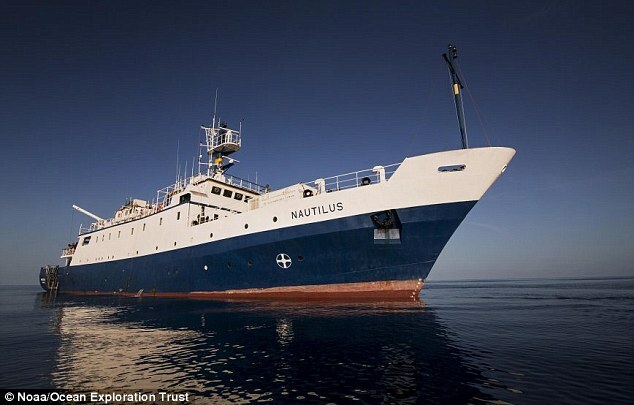 The mission will be run from the Corps of Exploration’s flagship vessel, E/V Nautilus. It is one of only two dedicated ships of exploration in the world. The 211-foot (64 metres) ship is equipped with all of the latest in ocean technology and can host a 31 person science team in addition to 17 crew members. The ship is outfitted for a two-tiered approach to exploration. Dr. Larry Mayer of the University of New Hampshire covers E/V Nautilus's cruise exploring the deep waters of the Florida Straits. First the team uses a multibeam sonar system to map unknown areas of the seafloor. Once the data is analyzed and targets are chosen, they use remotely operated vehicles to collect video footage and a variety of samples. Up to the end of 2014 the ship and its crew will continue to explore locations in the Gulf of Mexico and surrounding waters. In the great halls of La Boqueria, Barcelona’s central market, tourists, foodies and cooks gather every day to marvel at the fresh food, like pilgrims at the site of a miracle. The chief shrines are the fish counters, where thousands of sea creatures making up dozens of species gleam pink and gray on mounds of ice. But to many ocean scientists this is not a display of the ocean’s bounty but a museum—by the end of this century, many of these animals may be history due to man’s reckless abuse of the planet. As we keep dumping greenhouse gases into the air, the oceans keep sucking them up, making the waters deadly to their inhabitants. On the Boqueria’s fish stands I count 10 types of bivalves—creatures like clams, oysters and mussels that use calcium carbonate to make their endlessly varied shells. In as little as 20 years they will be very different and, in some parts of the world, entirely gone. Then there are the ranks of huge Asian prawns and tiny shrimps, terra-cotta crabs from Scotland, and lobsters, magnificent admirals in blue fringed with gold. Lucky for them, these creatures make their shells differently (mostly out of a polymer called chitin), so the rapidly acidifying waters of our oceans won’t dissolve them as it will the exteriors of the bivalves. But the acidification—which some scientists believe is the fastest change in the ocean’s chemistry in 300 million years—appears to harm the working of the gills and change the behavior of the crustaceans when they are very young. On the crushed ice sit a dozen kinds of finned creatures that the Spanish love—monkfish, hake, sardines, tuna. 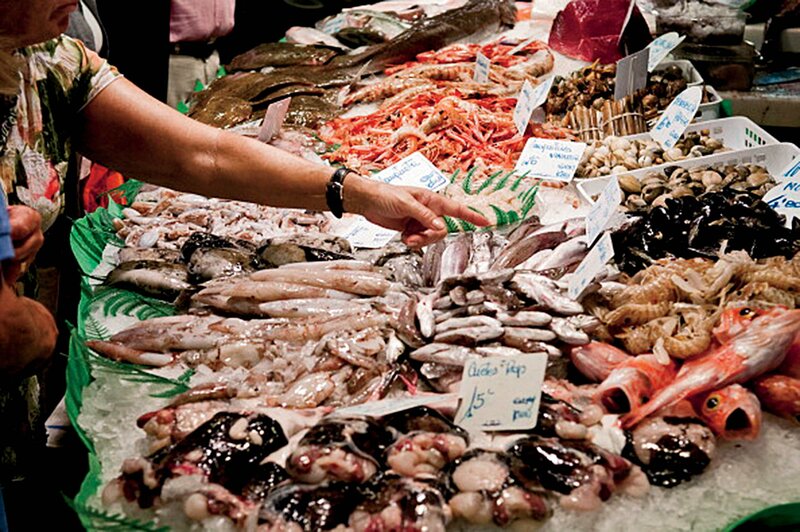 The Spaniards eat more fish than anyone else in Europe. The effect of changing ocean chemistry on fish health, longevity and reproduction is not yet certain. But even now, many species on the Boqueria stalls are also on one or more European “at-risk” lists: under threat because of overfishing or changes in the chain of foods that supply them, or from the bigger threat of the changing ocean biogeochemistry. The last is the least understood of these phenomena. Along the coasts and out in the deep, huge “dead zones” have been multiplying. They are the emptiest places on the planet, where there’s little oxygen and sometimes no life at all, almost entirely restricted to some unicellular organisms like bacteria. Vast blooms of algae—organisms that thrive in more acid (and less alkaline) seawater and are fed by pollution—have already rendered parts of the Baltic Sea pretty much dead. A third of the marine life in that sea, which once fed all of Northern Europe, is gone and may already be beyond hope of recovery. “There’s a profound game-changing event going on in the life of the sea,” says Callum Roberts, a professor of marine conservation at the University of York, England. Many of these risks are caused by one of the world’s most pressing problems: climate change. Rising greenhouse gases in the atmosphere are causing global temperatures to rise, which is leading to the melting of the polar ice caps, which in turn has resulted in rising sea levels and a host of ecological issues. It’s also causing the chemical makeup of the world’s oceans to change so rapidly. Carbon dioxide, one of the key perpetrators in the lineup of man-made greenhouse gases, is absorbed by seawater, causing a chemical reaction near the ocean surface that results in lowered pH levels. And about one-third of all the man-made carbon dioxide released into the atmosphere ends up absorbed by the oceans. He illustrates the basic mechanism to schoolchildren by getting them to take a straw and blow into a glass of water. A simple litmus test shows the children how the pH level drops as the carbon dioxide from their breath dissolves in the water. It’s a sign that naturally alkaline water is becoming less so—and it’s what is happening on a global scale as the oceans absorb a significant amount of the carbon dioxide we pump out through the burning of carbon fuels. For reference, the pH scale runs from 0 to 14; the lower the number the more acidic, and the higher the more alkaline. Pelejero leads part of the ICM’s marine biogeochemistry research, but his field is even more specific: marine paleo-reconstruction. You might call it seabed archaeology; it uses drills to take samples from deep in the sediment at the bottom of the ocean. Scientists can use those samples to work out how the geochemistry of sea creatures has changed over the millennia. Pelejero started in this business in the mid-1990s using the remains of plankton in the sediments on the ocean floor to determine historic sea surface temperatures. Then, in 1998, while studying a graph at a conference, Joanie Kleypas, an American biologist working on coral reefs, had a eureka moment. When she suddenly realized that the lowered alkalinity at the end of the 21st century would in effect corrode the calcium carbonate foundation of the reefs to destruction, she was so horrified she left the room to be sick. Her paper on the threat, published in the journal Science in 1999, was an alarm call. Other scientists quickly dubbed the effect “ocean acidification”—although the seas would not actually turn to acid, the phrase, they reckoned, would emphasize the urgency and get action. Coral reefs are necessary to an estimated 25 percent of all marine life, including 4,000 species of fish. They are the rain forests of the sea. Around the same time, Pelejero’s colleagues turned their core-sampling techniques to work out how the ocean and its animals behaved long ago, when the water pH was lower. During a 100,000-year-long event known as the Palaeo-Eocene Thermal Maximum (PETM), which occurred between the Palaeo and Eocene epochs, 55 million years ago, “you see that the sediment is quite white from the fossil shells—then suddenly it turns red,” Pelejero says. The first change from white to red represents a sudden die-off of shell-based life; the turn back to white shows the gradual return of shellfish over time. If projections hold, the pH change that killed off or radically altered many of the deep ocean shell animals will arrive again at the end of this century. Other problems are likely to emerge because of the pH change. One of the suggestions is that the stable, solid form of methane—called clathrates—that lurks in the ocean sediment may be upset by changes in water chemistry and temperature, and release the gas into the atmosphere. Methane is a greenhouse gas many times more damaging than carbon dioxide, which has, in the past, turbocharged global warming. This is called the “clathrate gun hypothesis,” and the core samples suggest that this is just what might have happened during the PETM, when large numbers of ocean species (particularly from the deeps of the seas) disappeared and the ocean surface was 9 to 16 degrees Fahrenheit warmer. That doesn’t sound like much. But it’s enough to radically alter life underwater—and to wreak havoc on land dwellers, too. Many of the world’s major cities would disappear beneath the rising waves as the ice melts and the water expands. During the PETM, sea levels were as much as 350 feet higher than they are today—enough to obliterate most of present-day Europe, the northeast coast of the U.S. and Argentina, for example. What worries Pelejero most is the rapidity of today’s changes. The same shifts that happened over the course of a few thousand years during the PETM are now due to happen over just a few centuries, counting from the beginning of the Industrial Revolution and the widespread use of fossil fuels. “The record tells us that, though pH has been lower in the past, this time the changes are happening about 10 times faster. And that means there is no time for species to evolve and adapt, or the ocean to buffer itself,” Pelejero says. Already some effects are being seen. Across the world, shells of some animals are thinner than they were 300 years ago. An acidification spike around the coast of British Columbia in February 2014 wiped out 10 million scallops. Foraminifera, the tiniest shelled plankton in the ocean, are having trouble growing (as they did during the PETM)—and plankton is the food base of every animal in the sea. Coccolithophores, the shelled plankton that process sunlight like a plant, and whose remains built the White Cliffs of Dover, seem to suffer from current changes in ocean chemistry. Pteropods, tiny swimming snails, are the main diet of cold-water fish most commonly consumed in both Europe and North America—salmon, haddock, cod and pollack. In the lab, pteropods dissolve in lowered alkali waters, like a tooth in Coca-Cola. In the Arctic, where acidification is progressing fastest, pteropods may already be on the way out. It is as though the Earth were losing its grass, and the cows had nothing to eat. A day after visiting the fish markets, I lounged on the deck of a tiny former fishing boat off the northern Catalan coast, as oceanologists threw up into the lurching waves around us. We were off to take ICM’s monthly water samples. The boat is skippered by a remarkable man, 63-year-old Josep Pascual, a legend around the fishing ports of the Costa Brava. As a boy, he went out in this boat with his father and grandfather to net fish for the market. He decided to add some hard data to the family debate. So since the mid-1960s he has been building his own instruments, and taking a daily record of sea temperatures at different depths in the Mediterranean current off the fishing port of Estartit, Spain. In that little harbor there’s a box containing an ingenious gadget attached to the seawall that measures the height of the sea. “I built it from parts that were thrown out of the old meteorological station,” Pascual says. He succeeded, and he has also shown that the average sea level in the Mediterranean has risen about 3.5 inches over the past 24 years. That is in line with the global calculations of melting ice cover made by climate change scientists. The rising sea levels, of course, are caused by greenhouse gases in the atmosphere—which are also what’s causing acidification. Pascual’s work came to the attention of the ICM in the early 1970s. Ever since then, ICM and Pascual have worked together. The fishing nets and lines on the Fiera del Mar are now replaced by global positioning systems, depth-measuring tools and complex thermometer instruments. They have done this long enough to prove significant warming of the Costa Brava sea. Seven years ago, sponsored chiefly by the Catalan and Spanish governments, Pascual, Pelejero and their assistants started making monthly trips to measure the ocean’s acidity. These have yet to produce conclusive results—there hasn’t yet been enough time to confirm the clear drop in pH that has been observed out in the open oceans. Pascual is a smiling, sea-worn man, his nut-brown face in sharp contrast to the biochemists’ laboratory pallor. I ask what he really thinks is going on. “What I’m shocked by most is the rising sea level—and I am convinced this is caused by climate change, and that it is mankind that has done it,” he says. Off the desert coast of Oman last winter, I saw the strangest thing I’d ever seen in a lifetime of sea voyaging. Heading in a rigid inflatable boat toward a snorkeling site, my family and I all gasped suddenly as the creamy-white of the wake turned a virulent, toxic-looking green. It had an ammoniac stink, and it stayed that way for the next mile. “No farming nearby? River estuaries?” asked Esther Garcés, a marine biologist at ICM, when I told her this story. The Omani coast I saw was mountain and desert. She showed me spectacular pictures, taken from a European Space Agency satellite, of a green-blue swirl occupying most of the Bay of Biscay, between western France and northern Spain. Garcés’s specialty is harmful blooms of algae and plankton: She makes weekly risk assessments for the whole of the Catalan coast. The chief issue is their potential harm to shellfish farms—when the bivalves eat the algae, the former can become toxic to humans who consume them later. All such blooms are on the increase, mostly due to pollution from humans on land. Sewage, extra carbon in the atmosphere and the runoff of artificial fertilizers all feed different plankton forms, making the blooms fantastically big. Human tampering with the shape of the coast can create vast areas away from the waves where the algae can peacefully breed. The 21st century’s algae can have adverse effects far beyond weird-colored water and a smell. The key problems come when plankton die. As the algae blooms die out, the matter that drops from the blooms to the bottom of the ocean eats oxygen as it decomposes (with the help of the bacteria that feed on the dead plankton), and hypoxic (low oxygen) and anoxic (total depletion of oxygen) zones kill everything that needs oxygen to live. Dead zones move and fluctuate, so they are hard to measure. Oceanographers believe they have increased exponentially since the 1960s, and now count over 400 across the globe. One of the world’s largest is off the Mississippi Delta, caused by algae blooms fed mainly by excess chemical fertilizers spread over the land through which the Mississippi flows. Though it changes from year to year, the Mississippi Delta dead zone has been recorded as large as 8,000 square miles, roughly the size of New Jersey. The Mississippi Delta zone is the world’s second biggest coastal hypoxic area, after the Black Sea. But out in the open oceans, hundreds of feet below the surface, there are dead zones so huge they may be bigger than the Sahara Desert—the largest lifeless spaces this side of the moon. There are three different forces that create zones where there's so little oxygen that most life forms disappear. “Upwellings” in parts of the ocean are natural, caused by ocean currents or undersea seismic activity. Periodically they bring nutrients and phytoplankton (a group of plankton that use sunlight for energy) to the surface. In sunlight this mass feeds on algae blooms, until it dies and the bacteria thrive in their turn, eating the dead plankton and absorbing more oxygen. The Black Sea is stagnant and dead from about 500 feet below its warm surface because of its natural geological structure, and the fact that there are few currents to mix up the oxygen-rich surface with the dark, highly acidic waters below. But a crucial sea for human food, the Baltic, has died because of the mess humans make. Algae blooms have been a feature of the Baltic since the 19th century, initially because nutrient-filled soil ran off as the native forest was cut down to fuel the industries and build the cities of Northern Europe. Then more plankton food was added by the runoff of pollution from the busy Baltic coastline (which includes major cities like St. Petersburg, Russia; Copenhagen, Denmark; Stockholm; Riga, Latvia; and Helsinki) as well as slurry from the industrialized pig farms that are a major business in parts of Germany and Denmark. Now much of the seabed is covered in life-choking seaweed (a multicellular type of algae), and fish eggs from species like cod cannot survive in the low-oxygen environment. “The Nordic people have made a huge effort to control the runoff of nutrients into the Baltic,” says Garcés. The one thing that the Boqueria fishmongers doesn’t sell is jellyfish (there’s not much demand for them in Spain, or anywhere else in Europe), though you can find them, dried to a plastic scab, in some Chinese supermarkets. There are those who say that jellyfish and plankton are all that your average wild seafood eater will have for supper by the end of the century—the very rich will likely still be able to pay up for ultra-rare food items. That’s because as the food chain’s intricate links collapse, the complex species will go first, leaving only the most simple. “The oceans [will] revert to the earliest days of multicellular life,” Roberts drily puts it. 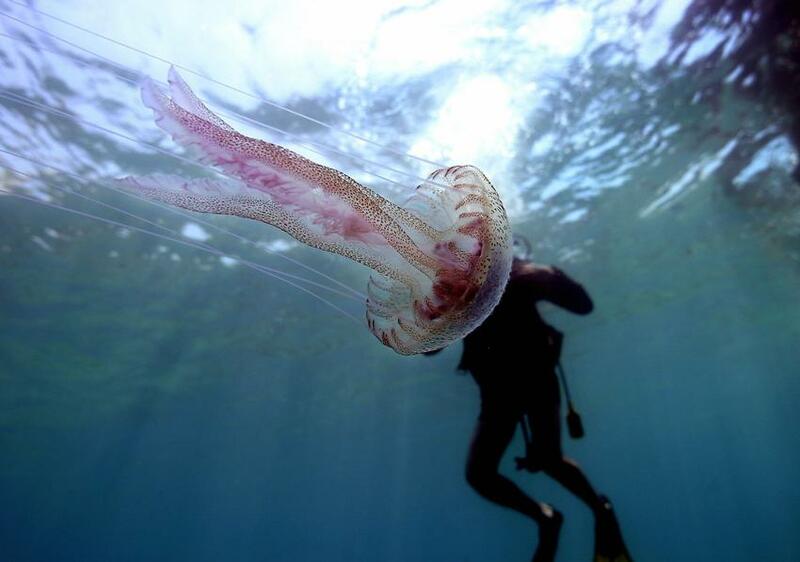 There’s a terrifying argument that jellyfish—who rather enjoy acidification—are already taking over the seas, if not the world. The answers are not easy. Some of the clever “geoengineering” suggestions offered to tackle global warming—like artificially cutting off sunlight—won’t work for the oceans, because we can’t just incrementally slow down the acidification — we have to remove the excess carbon dioxide that’s already out there in the atmosphere. Doing that takes economically painful initiatives—replanting vast areas of forest to recapture carbon, for example, and, above all, simply stopping the burning of fossil fuels. There are some causes for hope. Some world leaders are beginning to take these threats more seriously. In June, for example, the Obama administration announced a series of measures aimed to conserve the ocean as a key food supply for more than 3 billion of us. These included more ocean sanctuaries to curtail overfishing, and new funds to research ocean biochemistry, including acidification. 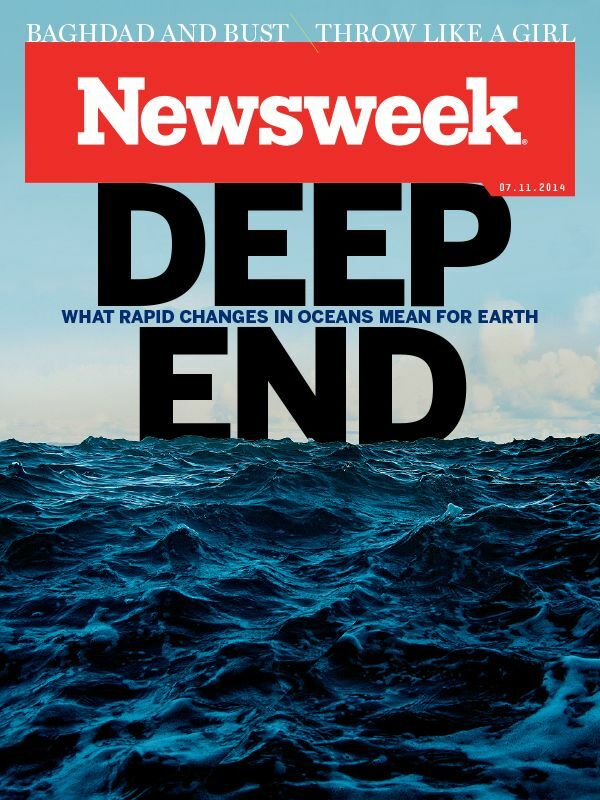 Roberts, for his part, says that he has been happy to see that coral reefs have proved more adaptable—faster and faster at recovering from the effects of acid and ozone layer depletion—than scientists previously thought. Recent research suggests than in the more acidic waters predicted for the late 21st century, the reefs may survive a little better than Kleypas and her colleagues originally expected. “That’s got to be cause for hope,” says Roberts. Airbus Defence and Space has published the first images obtained from the SPOT 7 satellite, a mere three days after its launch on 30 June. Over the last few hours, the entire chain – from satellite programming and image acquisition to telemetry reception and processing – was successfully put into operation to deliver these first spectacular images. The SPOT 6/7 constellation is now in place and considerably improves the capabilities and performance offered by SPOT 5, which has been in operation since 2002 and which is scheduled to be decommissioned from commercial service during the first quarter of 2015. This new constellation offers a higher resolution, greater programming reactivity and a much higher volume of images acquired daily (in monoscopic or stereoscopic mode). SPOT 6 and SPOT 7 mark the dawning of a new era for the SPOT family in forming a constellation of high-resolution Earth observation satellites phased at 180° in the same orbit. This means that each point on the globe can be revisited on a daily basis and wide areas covered in record time, all with an unparalleled level of precision. With both satellites in orbit, acquisition capacity will be boosted to six million square kilometres per day – an area ten times the size of France.